A group of men and women from Brandenburg refused to watch idly as people die in the Mediterranean. 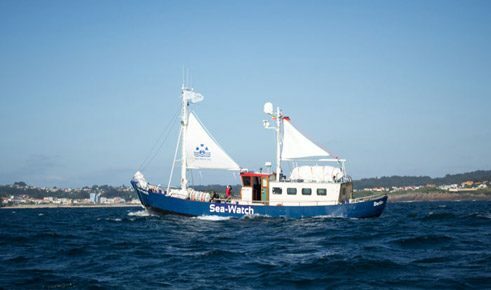 With their ship Sea-Watch, the helpers rescue refugees from the deadly trap. The businessman Harald Höppner doesn’t like the word “adventure”. Not, at least, when it is supposed to describe the action initiated by him and a couple of other citizens of Brandenburg. Since June 2015 Höppner and his group has been underway in the Mediterranean. With a refurbished fishing cutter, they take part in aiding refugees who board overcrowded boats on the Libyan coast so as to reach Europe. Each time Höppner and the others set out to sea from Lampedusa, they do not know exactly what to expect out there. Nevertheless Höppner doesn’t like to call the operation an “adventure”. That sounds too much like action tourism. “We’re not here to experience something.” Rather, he and the others want to contribute to helping that fewer people die in their flight from war and oppression. Höppner calls what he does a humanitarian action. It all began in indignation. In the autumn of 2014 befriended families from Barnim in Brandenburg discussed news of the refugee tragedy in the Mediterranean and the way in which the European authorities were proceeding in this matter. At the time Italy’s navy had just ended its aid programme Mare Nostrum because the annual budget of nine million euros had become too expensive and Italy was unable to obtain participation from partners in the European Union. Instead, the European border protection agency Frontex launched operation Triton, which cost only a third of Mare Nostrum and which, in the view of its critics, was too much about guarding the Italian border and not enough about human welfare. But the Brandenburgers didn’t simply want to feel disgusted. They wanted to do something. Thus emerged the idea of mounting their own aid programme. In December 2014 the group bought with their savings a hundred-year-old fishing cutter from Holland, refurbished it for another 60,000 euro, raised funds, gathered helpers and made ready to set off. At the end of March 2015 the boat was christened, and in mid-April a crew of volunteer sailors steered the Sea-Watch the 3,000 miles from Hamburg around the whole of Europe towards Lampedusa. Two months later they arrived, and since the end of June the Brandenburgers have been engaged in bringing refugees safely to Europe. “We’re no revolutionaries”, says Höppner, who normally runs a business for decorative lighting. “We’re very ordinary people; we have an idea, perhaps a vision.” What he means is clear: the action arose out of normal society, not on the drawing board of elitist protest actionists. Everyone can do something – that is the message. It is about neither confrontation nor politics. The crew of the Sea-Watch offers its help in accordance with the rules of common sense: in consultation with the Italian Coast Guard it makes itself useful as first responders and an additional emergency commando. Yet there is of course a little bit of politics about the action. Especially since it is designed as a media project – reporting expressly encouraged. The crew was so open at the beginning that after the first days in Lampedusa they had to relent. A reporter wanted to send reports every day on radio and television. This put the crew under pressure. It decided to remain open to journalists, but not to allow further live reports. Gradually Höppner and the others have grown into the everyday routine of refugee assistance. In a holiday flat in Lampedusa they have set up a small headquarters. Because the donations are insufficient to pay the captains, technicians and doctors for their work, there are only a few permanent crew members. Every two weeks the crew is recomposed, which does not make preparation for the missions any easier. But the group has the feeling that it is worth it. They were already part of the first rescue actions off the Libyan coast. The civilian refugee helpers of Sea Watch are now in the thick of this adventure, however much Harald Höppner may dislike the word. Thomas Hahn is the correspondent of “Süddeutsche Zeitung” for Northern Germany.